The Society's annual quiz night was held at the White Horse, and hosted again by Don Reed, who incidentally is the Champion of Champions from Channel 4's programme 'Countdown'. Thirty people in teams of four or five took over the conservatory and back bar for what proved an entertaining and enjoyable evening, with sausages-and-mash at half time. The theme this year was 'women' and we started with two rounds: one a picture round of famous (or infamous) female stars, and the other a variation on a multiple choice. For instance, which of these women immediately succeeded their father as regent? Who recently sang the song 'She' and to which film was it the title tune? Which South African town was besieged for the longest during the Boer War? Who was recently convicted of grand larceny and theft? What day is 'Lady's Day'? 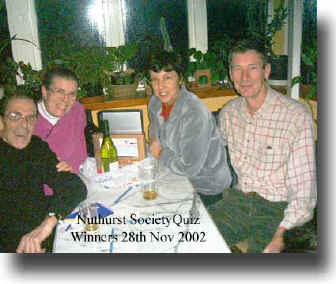 The winners, on a split tie, were Bill and Kathryn White, Jennie Smith and David Fisher with the rest of us not far behind. Thanks to Don for the well-judged questions, and to Fiona and Janie for organisation.